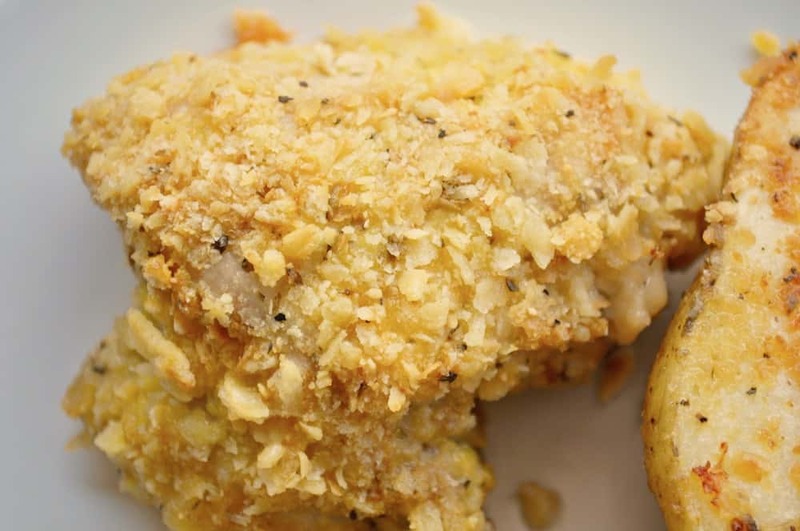 Oven Fried Chicken Sheet Pan Dinner is a new family favorite around here. Baked on one sheet pan crispy chicken and potatoes are done are ready and to serve in just 45 minutes. Add a salad and dinner is ready when the timer goes off. I’m awfully glad sheet pan dinners have sailed in and rescued me from my dreary dinner ideas, aren’t you? Have you ever actually MADE real fried chicken? I have and it wasn’t pretty. Two skillets, hot grease, is that chicken even done yet, will it EVER be done? And in the end, I was disappointed in the results. It just wasn’t good and it never got better. I’m going to keep on trying but until then I’ll be oven frying chicken thankyouverymuch. One pan to wash, one pan to the table, one pan to rule them all, oops no never mind that last one. HA! Why are sheet pan dinners so popular right now? No Idea! But I’m eternally grateful that they are and here’s to hoping they never become un-popular. I’m a sheet pan dinner for life kinda a girl and I’m never going back! Have you tried my Kielbasa Pierogies Sheet Pan Dinner? Or how about the Alaska Cod Sheet Pan Fajitas. Both quick and easy sheet pan dinners that get you out of the kitchen and back to your life. I plan to keep sharing 1-2 new recipes a month. Do you have any personal favorites? Or ideas for sheet pan meals? I’d love to hear them! Obviously, this recipe is endlessly customizable. Don’t like oven fried chicken thighs? Change them out. Can’t have gluten make gluten-free bread crumbs Like it spicy add a TBSP of sriracha to the eggs! Would you rather have sweet potatoes, try it out, it may be the best thing ever. I like this Oven Fried Chicken Sheet Pan Dinner this way, simple, done and ready to feed the family. I like to coat my chicken thighs with Dijon mustard and then roll them in pre-toasted panko bread crumbs, then bake at 375° convection for about 30 minutes. It’s about as easy as you can get and delicious too. That looks so golden and delicious! I have been loving playing with sheet pan suppers lately too and now I have to add this to my list of things to try! 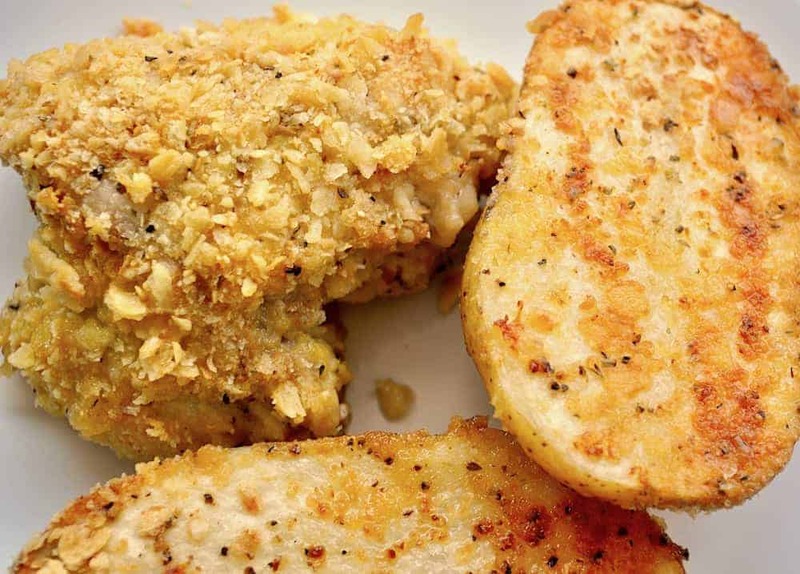 The best of both worlds…chicken and potatoes!!! YUM! I am all about my sheet pan dinners lately- this is one my kids would love! I’m all about sheet pan dinners lately and this one looks delicious! Less cleanup is always a bonus. 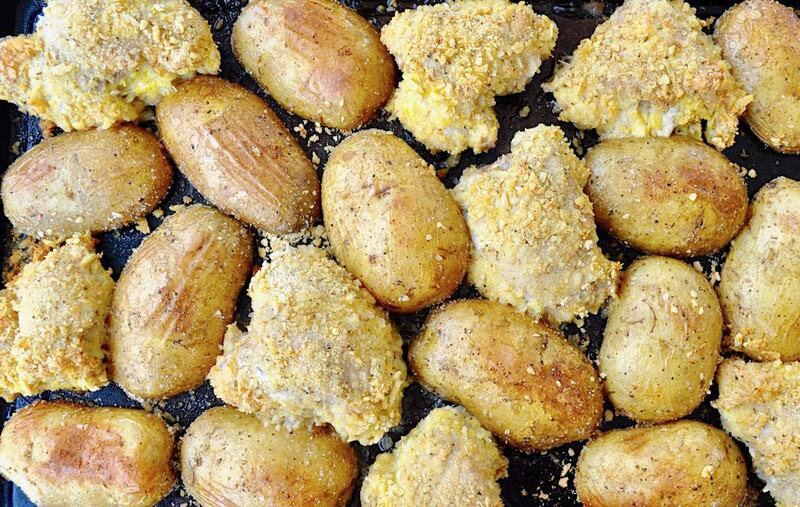 Chicken and potatoes baked together…I’m all in!!! Love oven baked recipes. SO much healthier than frying. I love fried chicken!! I haven’t made it in years since I had to cut out gluten, but I’ve been thinking of trying it again sometime with a GF crust of sorts and this sounds fabulous! 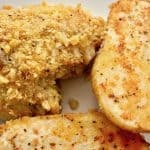 Chicken and potatoes makes a delicious and quick meal!